Are the Huskies in for a trap against Oregon State next week? And what about those true freshmen receivers? You called out, "Hey Jude!" and beat writer Adam Jude listened. He's here to answer your UW football questions. Happy Bye Week, everyone. Hope it has treated you well so far. Me? (Thanks for asking.) I’ve been fighting a cold (boo hoo) and trying to pick out new living-room paint colors (hoo boy). China Doll? Sensible Hue? Agreeable Gray? So many (too many) choices. And so many questions for this week’s #HeyJude Huskies mailbag. Thanks for the submissions. Let’s get to ’em. the dawgs have not lost when Gaskin gets more than 22 carries… Why do they ever go away from handing him the ball 20+ times? That’s a good stat and a true stat. The Huskies are 14-0 over the past four seasons when Myles Gaskin carries the ball 22 times or more. That includes his 28-carry, 148-yard, one-touchdown performance in the win over Stanford last week in his return from a shoulder injury. Gaskin’s durability has been one his greatest assists in his UW career — for a guy his size at that position to never miss a game until Week 8 of his senior year is a remarkable achievement. His injury loomed large in the October losses at Oregon and at Cal, and his value to the team was never more evident than it was against Stanford. That brings us back to the question from “bun.” Why not pencil in at least 22 carries for Gaskin every game if the formula is that simple? And, well, we just might see that very thing over the last handful of games of his illustrious career. This bye week comes at a good time for Gaskin to rest up that shoulder, and the thought here is the Huskies won’t need him 22 times against Oregon State at home next week. That should keep him (relatively) fresh for the Apple Cup and for a potential return to the Pac-12 championship game. Running backs coach Keith Bhonapha deserves credit for how he’s managed Gaskin’s carries throughout the running back’s record-setting career, gradually building up his usage and peaking in November. The Huskies have traditionally relied on Gaskin more and more the deeper into the season they get, and he’s had many of his best games in November. (Throw in his performance in the 2016 Pac-12 title game — 29 carries, 159 yards — and his late-season surges are all the more impressive.) 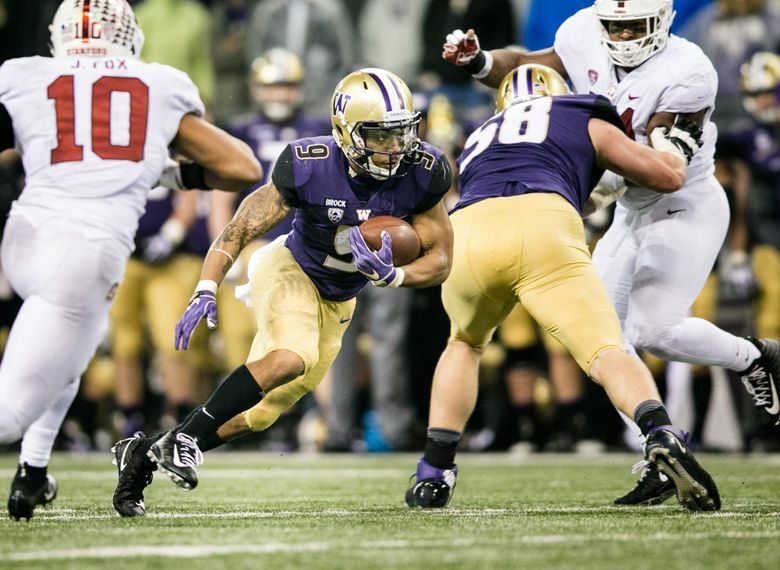 If that shoulder holds up, Gaskin will continue to be the focal point of the offense down the stretch. In short, no. Probably not. The Huskies have played seven true freshmen this season (all of whom at this point are still on track to redshirt): DL Tuli Letuligasenoa, LB Jackson Sirmon, LB MJ Tafisi, OLB Zion Tupuola-Fetui, CB Kyler Gordon, DB Julius Irvin and CB Dominique Hampton. There’s been a lot of questions and intrigue about those freshmen receivers, none of whom have played. There’s a chance they could see some action in, say, the Oregon State game if things go well for the Huskies next week (but it’s just as likely that senior walk-ons John Gardner and Max Richmond would get more snaps in a mop-up situation on Senior Day). If coaches thought those true freshmen were ready and able to play, they would have played by now. With Quinten Pounds (torn ACL) and Chico McClatcher (personal leave) both out, we have seen more of redshirt freshmen receivers Terrell Bynum and Alex Cook, and I’d expect them to continue to play over the true freshmen the remainder of the season. Will OSU be a trap game? Will coaches go extreme vanilla and make it an even worse trap game? Those are fair questions, especially with the Apple Cup — maybe biggest Apple Cup of them all — looming six days later in Pullman. But at this point in the season, with so much on the line, and with the loss at Cal still pretty raw, it’s difficult to imagine the Huskies looking past Oregon State. Add in the Jonathan Smith factor — he knows this staff and the Huskies’ tendencies — and one would think these UW’s coaches would use every edge, every play, every trick at their disposal to get to 6-2 in Pac-12 play. Plus, it will be Senior Day (with an afternoon kickoff!) and a chance to send off in style one of the most successful senior classes in program history. Crazy to think about, but the Huskies could lose up to nine starters from this defense after this season. (That counts senior defensive-lineman Shane Bowman, who could be back from a broken foot at some point this month.) Taylor Rapp and Byron Murphy will have tough decisions to make. Both could be projected as second-round NFL draft picks — or perhaps even higher — and that would be a difficult to turn down. Fortunately for Jimmy Lake, he has recruited the secondary well the last few years, and he has options, as Paul notes. Sophomore Keith Taylor has played well with Jordan Miller limited in recent weeks, and Gordon, Irvin and Hampton could all push for a starting job at the other corner if Murphy leaves early. Safety would be a concern if Rapp declares early, leaving sophomore Brandon McKinney as the only safety on the roster with any real game experience (and even that is limited). One of the most surprises stats in the Pac-12 this season: Washington State has allowed just seven sacks in its first nine games, a stunning number for a team that throws the ball more than anyone in college football (53 times a game). Sure, you could point to the many quick throws designed to keep Gardner Minshew away from pressure, but that’s still really impressive. By comparison, the Cougars allowed 57 sacks in 12 games in 2012 — nearly five per game — during Mike Leach’s first season in Pullman. And, oh by the way, the Cougars this season also lead the Pac-12 in defensive sacks, with three per game. So, yes, the line of scrimmage figures to be a much different matchup in the Apple Cup than it’s been the past four years. Not sure the Huskies can rush just three and hope to disrupt the QB the way they have in recent years.